A new year of reading awaits, and with so many incredible books to read, sometimes it is difficult to decide where to start. Story is paramount, of course, but price also factors into making such decisions. Soho Crime has your back. This weekend, all of our first-in-series ebooks are on sale for $4.99. There are more than 30 books available, each set in an exciting, far-flung location, driven by plots that thrill, reveal, and surprise. Scoop up as many books as you please, there’s no limit to how many you can add to your cart, and start 2019 on a Soho Crime reading bender! 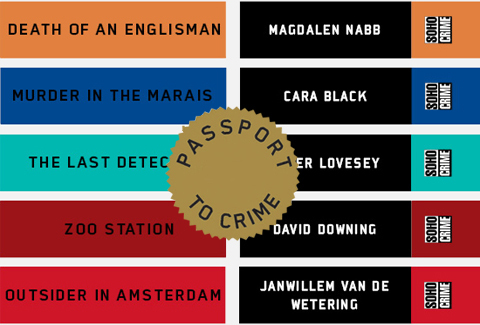 There’s even a Passport to Crime booklet you can download. It includes food and drink recipes, discussion questions, and handy maps that point out where some of the books are set. To read any of these ebooks for $4.99, visit the Passport to Crime page and choose the books you want to read. Happy reading, everyone. And happy 2019!